If you are an attorney already admitted to practice in this court and you are requesting a CM/ECF login and password, please fill out the form below. If you are not a lawyer, click here for more information. If you are an attorney applying for admission to this court, do not fill out the form below; a CM/ECF login and password will automatically be issued to you upon the processing of your admission application. The login/password infomation will be emailed to you at the email address listed on your admission application. 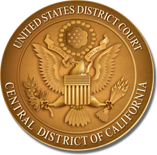 NOTE: Attorneys must be admitted to practice before the Central District, either by admission to the Central District Bar or by pro hac vice order. Otherwise no account will be created. For information about attorney admissions, click here. If you have a California bar number please enter it here; if admitted pro hac vice, enter "PHV." I certify under penalty of perjury that the information above is true and correct. I further agree to abide by all Court rules, orders, policies, and procedures governing the use of the Court's Electronic Case Filing System. The combination of user ID and password will serve as my signature when filing documents. I will protect the security of my password and immediately notify the Court if it is learned that my password has been compromised by an unauthorized user.